This has to be my favourite way of enjoying beef fillet, where the beef is poached, dangling on a string (à la ficelle), in excellent stock. The meat is tender and rare, the broth is restorative and delicious, there are plenty of vegetables and the condiments make each bite exciting. 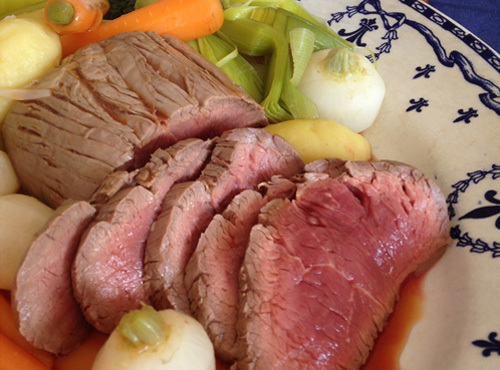 It is really a speedy version of pot-au-feu, with the beef fillet taking the place of slow-cooked brisket or shin. For ease of eating, provide each diner with a small side plate on which they can put a little of each condiment. Soak marrow bones overnight in cold water. Next day, tie a piece of string around the centre of each chunk of beef, leaving a long end, then tie ends of string to the lid of a large saucepan or stockpot. The string should be just long enough so that, when the lid is on, the meat will be suspended in the pot and not sitting on the bottom. Practise with lid, string and pot before proceeding with recipe. Set meat and lid aside. Preheat oven to 100°C and put a plate in to heat up. Bring 2 cups stock and 1 cup water to a boil in the saucepan. Simmer carrots until barely tender, then remove with a slotted spoon and reserve in oven. Repeat with leeks, turnips and potatoes, cooking each separately in the same liquid. Strain cooking liquid into remaining stock, then return this to saucepan and bring to simmering point. Carefully lower meat into simmering stock and put lid in place. Cook for 8 minutes, then remove to a heated plate to rest for 5–10 minutes (not in oven). Discard string. While meat is resting, drop drained marrow bones and reserved vegetables into broth for a few minutes to heat through. Remove with a slotted spoon and divide between 6 wide soup plates. Cut each beef chunk in half to expose its rosy interior, then transfer 2 halves to each plate. Season broth to taste, then ladle enough into each plate to make the dish a bit ‘soupy’. Scatter with parsley and serve with a selection of condiments (such as cornichons, sea salt, Dijon mustard and horseradish). Ensure your guests have a large spoon as well as a knife and fork.